Designed to assist the patient from early parallel bar use to a full Infinity Walk progression of sensorimotor, cognitive-language and other multi-tasking skills while maintaining attention and balance. Browse Dr. Sunbeck's Infinity Walk site, watch her free video and learn how her Infinity Walk Method benefits students, patients, children & adults. "When I started developing Infinity Walk theory and method back in the mid-1980's, my initial focus was on its psychotherapy benefits, and Infinity Walk's value in value in value in early education and special education. 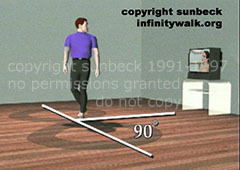 Today Infinity Walk is used in pre-schools and nursing homes alike, and has both self-help and clinical treatment versions, as well as an Infinity Riding version. Infinity Walk is used by clinicians in	occupational therapy, physical therapy,	developmental optometry and vision therapy,	speech therapy, and	neuro-rehabilitation. My invention of	Infinity WalkAbout rail systems was a response to this need. Educators all over the world have brought Infinity Walk to their schools. Infinity Walk is time-cost effective; is easily assimilated into clinical and educational programs; and, can be seamlessly implemented across languages and cultures. I welcome your feedback and success stories. Send them to	sunbeck@infinitywalk.org	"
6) seamless team approach for allied health rehab providers. 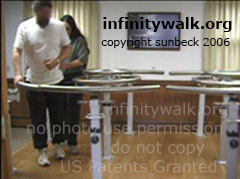 Copyright � Sunbeck, All Rights Reserved Infinity Walk� and Infinity WalkAbout� are US Trademark & Patent Protected.